Grace Habit, Part 13 - Can God Spoil Us? This is actually part of something I've been thinking about for a little while - almost as long as I've been pondering the whole Grace Habit. What do you think? Can God spoil you? Has He spoiled you? Do you know someone who God has spoiled? I'm willing to bet a delicious sammich - right here and now - that 95% of us answered "no, nope, and yes" to those three questions. And I don't know about you - but it goes WITHOUT saying that my parents did NOT spoil me. And my confidence on that has almost nothing to do with none of my relatives reading this. And you seem pretty cool - so obviously you're not spoiled either. Awesome. 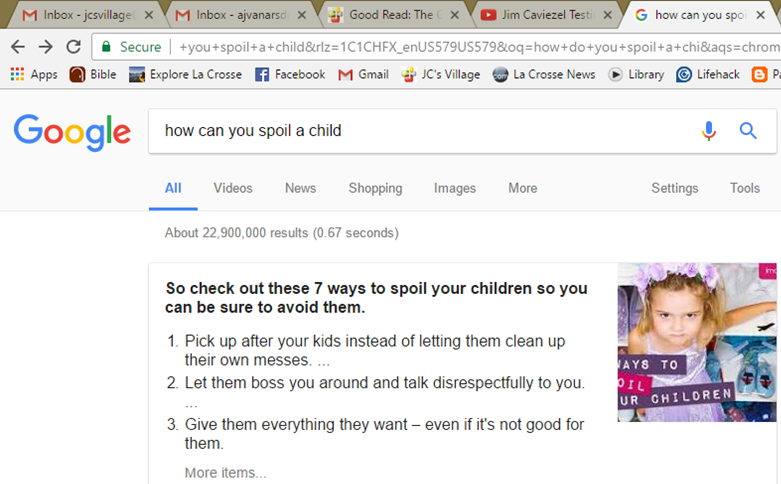 If you look up (and by look up I mean google) "how to spoil a child" - you'll get the above gem - with a link to the rest of the list - which you can see for yourself if you're interested by clicking here. But our question is not can kids be spoiled - because that seems rather obvious. Instead our question is can God spoil US? Based on what we can read about God in Scripture - that He's perfect, holy, just, righteous and loving - God seems ill-equipped to spoil us - or better put - the perfect entity to un-spoil us. Actually I'm of the opinion that God's ability to un-spoil us is directly proportional to our willingness to authentically pursue a growing and real relationship with Him. Who could ever stay spoiled even just a little in the face of learning about and incorporating into one's life the teachings that Jesus spells out - for instance - in the Sermon on the Mount (Matthew 5-7)? At least for me - it seems like nearly everything out of Jesus' mouth is well-suited to illuminate any cozy entitlements, prejudices, cravings and expectations my ego is clinging to. What about those people in Scripture who seem to have been recipients of some profound favor - people like Abraham, Moses, David and Elijah for instance. What about them? Were they spoiled? Were they God's "perfect little pets?" Did everyone around them just roll their eye-balls so hard you could practically hear it when any of those individuals names were called out when God wanted to give "someone" special recognition? If you read these stories ... you come across little bits of information about these individuals that hints that they invested their lives in God in some remarkable ways. I'm inclined to believe that we're all God's favorites and some of us really take that to the bank - such as Abraham did - in having the requisite faith to pick up and move his whole family away from the rest of the clan - and then giving God his long-awaited and promised son to boot. You read about Moses' putting all the entitlement of royalty at risk to relate to his countrymens' plights in Egypt. David had a life-long habit of putting his life on the line for others - and spent the majority of his life putting his life at stake for God. We know he wasn't perfect - but neither am I - and I don't put my life at stake. And on and on it goes. Honestly - this whole idea of "can God spoil us?" is the basis of the book of Job. Satan was accusing God of spoiling Job. It seems that the only way God can really spoil us - is with His love. Encountering God's love though tends to have the exact opposite effect of spoiling us though. In fact - it seems that those struggles that inflict the most damage on the body are precisely the ones that frequent and meaningful encounters with God's love counteract. Hypocrisy, judgement, self-righteousness, bitterness, dissension and strife - cannot survive long in the face of God's great love. It seems like the more we walk dependent on His Love and Grace - the more we become - strengthened against these spiritual diseases. May we then all be so dependent on God's "spoiling" Love and Grace that we would be every earthly good to those around us - and a testament to Heaven's good will towards us all. April 26, 2017 /JC's Village C.C.M.